First participation for the Welsh in 2012 in Denmark, where they finished 12th out of 14, they then participated in each edition, sailing around the middle of the table. In 2007, they finished in 7th place, their best result so far. SFisher will take a fairly experienced team if we refer to the relative youth of this nation on international competitions. With a total of 14 selections for players from 8 Welsh, and only 3 rookies, the average NAF rankings flirts with the 190. We find a very very big player in the person of Andydavo, but with 2 coaches under 160 NAF on quite demanding rosters, it will really have to get half a point. Recall that this year, not accumulated individual points, but many victories, draws and defeats of teams … The level will be tighter than ever and the least match will count. Welsh captain SFisher will celebrate his 5th participation in a Eurobowl. 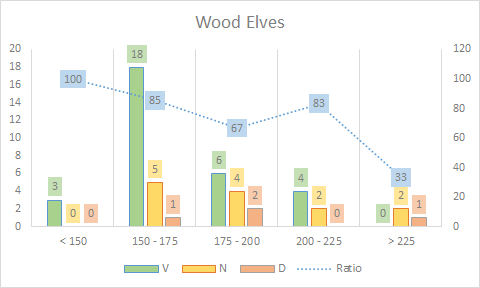 After Lizardmen 4 times without much success (4/11/9), he will take this year the reins of Wood Elves, a roster with which he has his best ranking (190.97)! 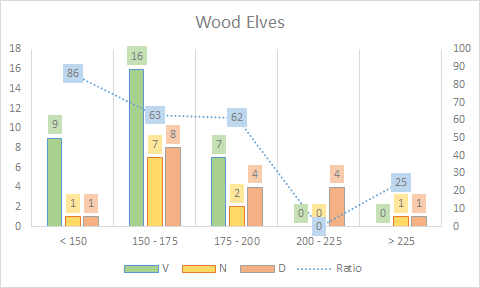 Overall, on his Wood Elves, he displays 31 V / 10 N / 18 D, for a ratio of 61.02%. We can notice below that even if he seems to be quite experienced, his statistics fall as soon as the opposing level seems to rise (2 victories out of 12 games against the players with more than 175 NAF) and it does not have for the moment never beat opponent to more than 225 NAF, in 3 games. Most certainly the Welsh player to watch. 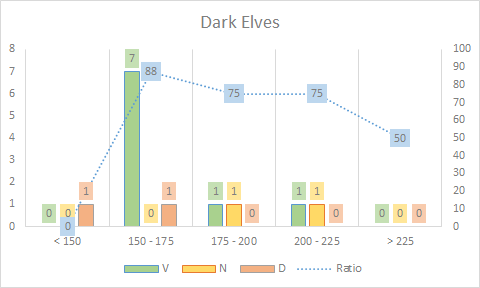 2nd in the world with Dark Elves, behind the Danish Kfoged, he has a completely monstrous ratio of 78%! On the graph below, we can even note that he simply never lost against an opponent with more than 225 NAF (6 wins and 2 draws). Andydavo will participate in his 3rd Eurobowl, after the editions 2016 and 2017, where he had already played Dark Elves (9/2/1 cumulative). No doubt he will be the driving force of this team. The difficulty for his teammates will obviously be to keep pace to get the team wins. Dionysian, the second player of this 8 to exceed 200 NAF on his roster, will be at home with his amazons, with which it displays a ratio of … 81.82 (16v / 4n / 2d)! With a ranking of 211.79, he is ranked 22nd in the world on this roster. This will be his 3rd participation in this competition, after 2 editions in Wood Elves in 2014 and 2016 (4/5/3 cumulative). However, this ratio is to be taken with a pinch of salt. He faced only one player with more than 200 NAF (for a victory however) whereas he never lost against a player under 175, he is already only 3/2 / 2 out of the 175 – 200. It’s a little unknown, on a roster that is difficult to face. It will obviously be necessary for his opponents to be wary of him and Wales will need to be on top! The dwarf coach of this selection is a very experienced player, playing in his 5th Eurobowl. He twice coached the Dwarves before (3/6/4), once Undead (0/3/3) and, last year, humans (3/0/3). 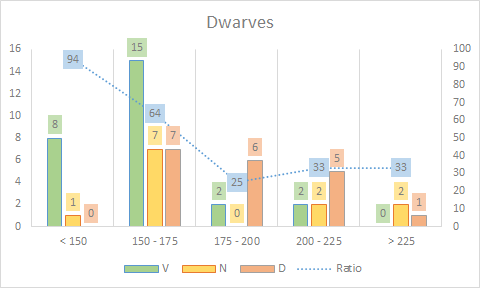 Overall, in Dwarves, it comes out a statistic of 34v / 28n / 25d, for a ratio of 55.17. 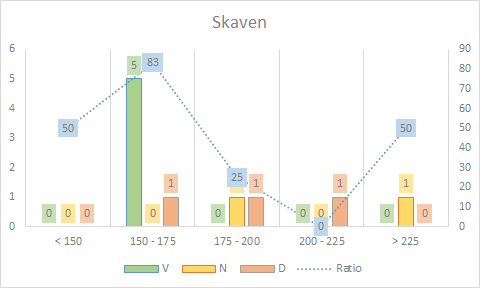 We can see on the graph below that, whatever the level of his opponents, his results are average, with ratios of “only” 56 and 59 against coaches under 175 ranking. The Welsh undead player will participate in his 3rd Eurobowl, still on the same roster. He currently has a record of 4v / 4n / 3d (55 ratio). 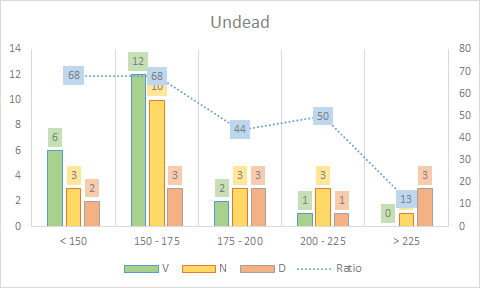 Overall, in the Undead, it is currently on a ratio of 58.49 (21/20/12), with very good results against opponents under 175 NAF. He has the advantage of having had the opportunity to play a lot of good level coaches, but without having extraordinary results. If he seems to be playing match with those between 175 and 225, his 4 games against “Top players” beyond 225 NAF ended in 3 defeats for a draw. The Welsh group can in any case rely on him and his experience! First Eurobowl for Fluffythealien also, at the head of the Norse, which is almost the only roster he has played since his debut in 2017. To date, he displays 9/5/11, for a ratio of 46. He has had the opportunity to meet a few players with ranks over 200, but has not yet beat any. He is finally positive only against players whose rank is less than 150. He will need to drastically improve his statistics during the competition to allow the Welsh to go for the victory on the difficult later rounds. The Swiss will celebrate 10 years of their first participation in a Eurobowl this year. They made their debut in Spain in 2008, finishing in 9th place. During their 8 participations, they have blown hot and cold, from a last place in Denmark to a very good 4th place in Portugal last year! Whilst we could expect to have exceeded 190 NAF average after the Welsh and their 189.58 yesterday, we find the Swiss, just under 190, led by Strider. The Swiss captain has clearly decided to rely on a very experienced team this year with 25 caps! Here is the total of 8 players who will represent Switzerland in Cardiff. The Helvetians give themselves the means of their ambitions, after a magnificent 4th place last year. Strider (84!) will play his 5th Eurobowl this year, having been on the adventure every year since 2013, and for the second in a row will take Wood Elves (3/2/1 at Porto last year, beating notably the Lizardmen of Sebotouno in Round 1). He has previously played Amazons, Humans, and Lizardmen. In total, all Eurobowls and rosters combined, it displays a record of 10v / 9n / 5d. This year, he will take the lead of the Elves Sylvains, his best roster if we rely on the NAF rankings, since he is ranked 28th in the world, with 222.25 ranking, and a ratio of 68.52 (16 / 5/6). Below, we can see that it has a negative ratio on no slice of opposing rankings, being in balance on the opponents of more than 200. What jumps out in comparison with the article Welsh yesterday is the number of games played against opponents of a very good level, with 12 games played against rankings above 200, out of 27 games in all! He is a player very used to playing at a high level, with the results that go in this direction. Registered on the NAF since 2003, Jokaero is a scarecrow in this Swiss team. 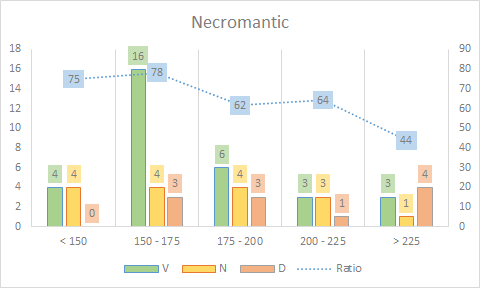 Extremely experienced, he will participate in his 7th Eurobowl, playing the same roster as last year: Necromantic (3/2/1 in Portugal). Before that he has played Skaven, 2x Dwarves, Lizardmen and Undead. He has 12 wins, 11 draws and 13 defeats to date at Eurobowls. 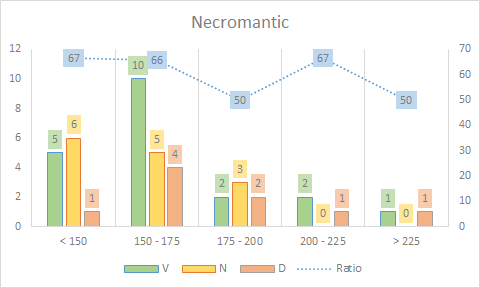 Lately Jokaero has become a reference point of the necromantic roster, rising to the 5th place in the world, and with more than likely results for a roster called “Tier 2”, whether vis-à-vis or online. With a ratio of 67.80 (32/16/11) he will be one of the players to watch closely in this Swiss line up. Like Strider he is accustomed to regularly face players over 200 NAF (15 games out of 59) and that his ratios against these levels of opponents are more than respectable. His opponents are warned: it will be very difficult to defeat him. The first coach mentioned in this article series (unless I am mistaken) to have completed the “26-Rosters Tour”, Kithor has played in all 122 NAF tournaments since its debut in 2004! The European scene has no secrets for him, since he will participate in his 9 Eurobowl! Present in Portugal playing Norse last year (1/4/1), the Swiss have decided to rely on his experience and his level of play at the head of the roster men-lizards, he has never coached at a Eurobowl. He is not a novice with this roster either; from his 48 games (16/13/9) his ratio is 67.71. This is not his ‘best’ roster despite his 203.47 ranking. He is, for example, 5th in the world with Amazons (241,89), and so it is a surprise that this roster is not in the Swiss 8 despite the presence of a player of this level. Playing Dwarves, whose French coach nightmare still continues today ( ah this bomb to a Troll Slayer, imprecise, which deviates in the arms of the target player at the start, in the goal, in the 16th turn of the last round of a Wolf Cup, one evening in October 2013! ), The Troll will take the Swiss on the roster he masters best. 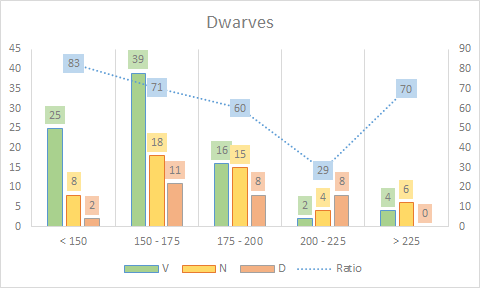 166 games played with his Dwarves, for a ratio of 67.17 (86/51/29). He will participate in his 4th Eurobowl, all 4 with Dwarfs. He is also the first player since the beginning of this series to have played in the Eurobowl and the Europen (skaven last year). It shows; on the Eurobowls he is 9/9/1, for a ratio of 71.05 and a single defeat, which is very impressive given the roster that many consider extremely treacherous played by the Troll! Note also that during these 3 competitions, he is undefeated against the French. He beat Simon’s Nordiques in 2014, then draws against Jeff’s Undead in 2012 and Titouch’s Wood Elves in 2013 … not the worst French yet. As for his opponents we realise that he faces players over 200 NAF regularly, and whilst we see difficulties on the 200 – 225 range this is countered by being simply undefeated against players over 225, with 4 wins and 6 draws! The Troll can clearly be the type of player that will convert the dynamics brought by his teammates on top tier rosters by looking for the results with his Dwarves, which will result in the team victories! Compared to the previous 4 players Sipa is almost a rookie! 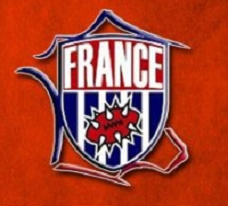 Although registered with the NAF since 2013, this Eurobowl will be his baptism of European fire, since he has never played outside of his country. During the 7 tournaments in which he participated, he only played Dark Elves, a roster on which he was logically selected by his captain. He has a ratio of 60.42 (12/5/7) and we notice on the graph below that he has never beaten players over 200 NAF (although in his defence he has only faced them 3 times). Sipa will benefit from the lack of knowledge that his opponents will have of him. We can assume that if Strider has bet on him it is certainly for a good reason! Second selection for Madmatt, after that of last year in Porto with Chaos Dwarves (1/1/4). Like Sipa he seems to be a player with relatively little experience compared to his team mates. Only 7 NAF tournaments played (including a Eurobowl) but very active online, he will represent Switzerland with Undead, a roster he has played in only 2 tournaments and 9 games. So unfortunately, there is little to be gained from the graph and its results. And once again his opponents will have to work out a player against whom they will have little reference. This is the 4th Eurobowl for Otis, who has always played Chaos Dwarfs in previous appearances (9/6/4). This year, the choice of roster was focused on humans, which is one he has not played a lot so far. His record is 13v / 6n / 7d, for an overall ratio of 61.54. More experienced than his 2 predecessors in this article, we have little to learn from his results with Humans. 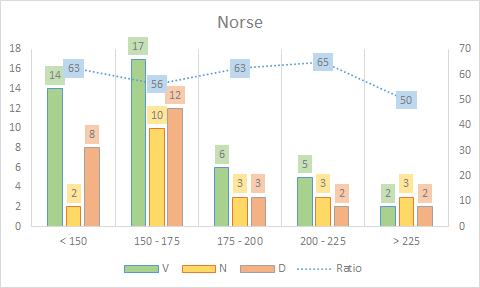 It shows that he usually dominates his opponents, even on the 175 – 200 slot, but he has never faced an opponent more than 200 – opponents he should meet during the competition if the Swiss reach the tables they are aiming for. Good “last” in the NAF rankings of Swiss players. Ultra experienced with his Orcs (125 games), he will play his 5th Eurobowl, the 3rd with Orcs. His results with Orcs at Eurobowls give a ratio of 52.78 (8/3/7), for 50.40 overall (43/40/42). 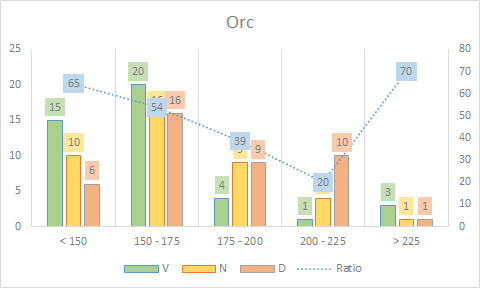 He has also faced high level players many times, and his ratio to players> 225 is remarkable, especially given that Orcs are often considered difficult to perform well with at this level, and we can notice that his results against players from 175 to 225 rankings are more complicated. Will Phifoe bring the full potential of his roster, which he knows by heart? This will certainly be essential for the Swiss to rub shoulders at the very top tables! In 8th place we find (surprisingly) the Danes. Why surprisingly? Because if you cumulate the best NAF rankings of the 8 players, the average rises to more than 225. We will see below that Plasmoid has decided to play the surprise this year, with rosters sometimes very little played by the coaches. This is the 12th participation for the Danes. It is not complicated, they have been present each year since 2004, also hosting in 2012. After finishing in the middle of the table in the first years, Denmark has become a major nation, finishing since 2010 systematically in the Top 5! No title yet, and this despite 3 podiums: 3rd in 2012 at home and second in 2010 and 2016. A total of 44 caps for the 8 Danish! It’s just monstrous! Plasmoid, non-player captain of this selection, decided to play the card of the change … of rosters, for lack of coaches. Ultra-experienced players on solid rosters but on which they have less of a benchmark, it is the bet of the this tournament. With Kfoged we enter the very top of the world level! 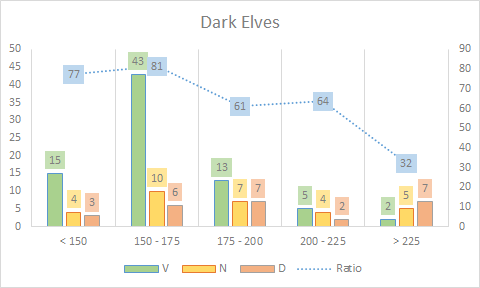 Second in the world ranking NAF (all rosters combined) with his Dark Elves, ahead only by Jimjimany, he was certainly eagerly awaited on this roster. But this year, it is he who will be at the helm of the Wood Elves, leaving the Dark Elves to Topper. Kfoged will play his 6th Eurobowl, his first with Wood Elves. 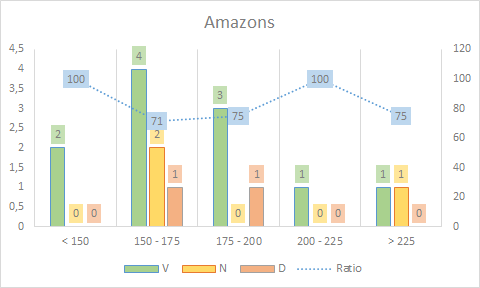 He had for the moment only played Amazons (6/1/5) and Dark Elves (6/5/8), for a cumulation of 12v / 6n / 13d overall. Whilst not at the stratospheric level of his Dark Elves, he does not have to blush on the Wood Elves. 16th world, with a ratio of 78.13 (31/13/4), we note that he does not lose with them, or almost never, just 4 defeats in 48 games. We note that although very comfortable against opponents above the 175 ranking, he has yet never sought a reference victory on this roster, since in 3 games against opponents over 225, he is 2 draws for a loss. Clearly the technical leader of the Danish, so to see him on a premium roster is reassuring for no one! 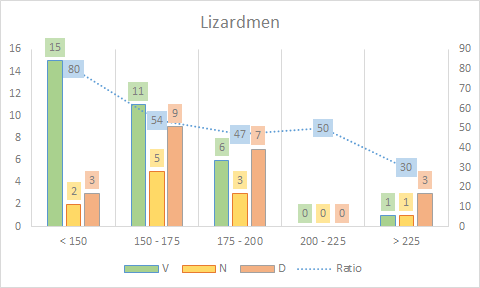 The 3rd selection for the Lizardmen coach of this Danish selection. He remains on the same roster that he played in the 2016 and 2017 editions, for a balance of 5/5/2 (ratio 62.5). In total, he has played 80 games with the lizards, for a record of 40/26/14 (66.25 ratio). A very solid player therefore, who loses very little. 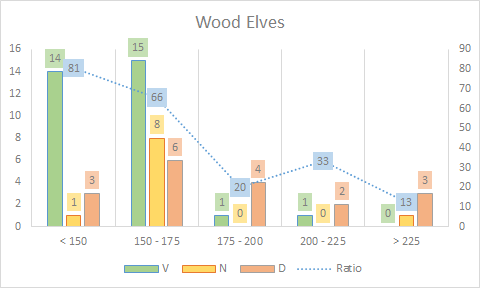 His record is also very good against players over 175 NAF, although like Kfoged with Wood Elves he has never beaten a player to more than 225 so far. A player who will be very difficult to manoeuvre therefore, who is “negative” on no racial match-up. Even against Wood Elves, the nightmare of the lizards, he is to date at 2/1/2. Like Jaqra, SpecialOne will celebrate his third selection this year. 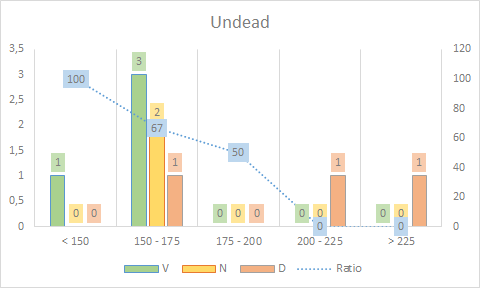 After his first participation with Chaos Dwarves (2/3/1) in 2016, he once again has the confidence of Plasmoid on the Undead that he played last year (4/0/2). Despite good results on this roster and a ranking beyond 200, SpecialOne has played only 22 games in Undead, for a global record of 12/6/4 (68,18). He also does not lose much, but again, no victory against players over 225 NAF and we note that he is at best in balance against the players over 175. He does not lose however facing less experienced coaches. In the end, little concrete data to draw from his record because of the low volume of matches, but it is clear that it will be necessary to be wary of a player who looks very solid. If it was adventures of 2016 and 2017, given the Danish results, he was not re-selected for nothing. 7th Eurobowl for Tank, who will play Amazons for the second time after 2016 (4/1/1). 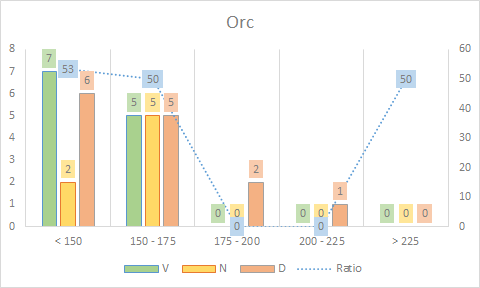 Long used to bash rosters, since his first 4 selections were on Orcs, before passing to Amazons and Dark Elves last year, with less success (1/3/2). 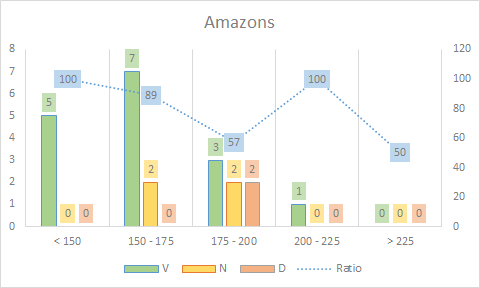 It is undoubtedly this balance that has led to the choice to return to the Amazons. It is on this roster that he has his 2nd best ranking, but with the best ratio (and by far) since he is 78.13 (11/3/2) overall! We have the feeling, in view of all rosters so far chosen, that the focus has been on the goal of not losing the games, and therefore the rounds. The change of rules of scoring of the competition may have led to this reflection. He has only played 16 games with Amazons since his debut, so again, we must take this record with tweezers. However, we note that for its part, it is positive on all levels of adverse rankings, paying the luxury of not having lost in its 3 games against opponents over 200 ranking. Still an ultra-experienced player on the international stage! MrCappuccino, as well as Tank, will play his 7th Eurobowl! He alternated years at the head of Undead (11/3/11) and Dwarfs, a roster that he will replay in Cardiff. To date, there is a balance sheet of 6/2/4 (3/1/2 at each time), or 58.33 ratio. 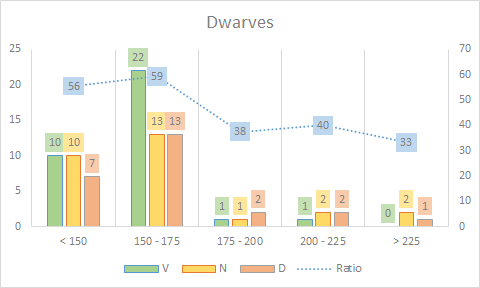 In total, he played the Dwarves 58 games (27/12/19 – 56.90 ratio), but we realise that his results are quickly complicated when the opposition is of a very good level. With a record of only 4 wins in 20 games against coaches above 175 rankings, we can expect the Dwarves to struggle in Cardiff. A MrCappuccino to show us that he will put his experience forward to bring to the Danish points and half-points that will allow them to live up to their ambitions. 7th cap also for MissSweden, player voted the most handsome of the last World Cup! 2 times at the head of the vampires (5/5/3) and Chaos Pact (6/4/2), he played Underworld in 2017 (2/1/1). Accustomed to playing complicated rosters, the world No. 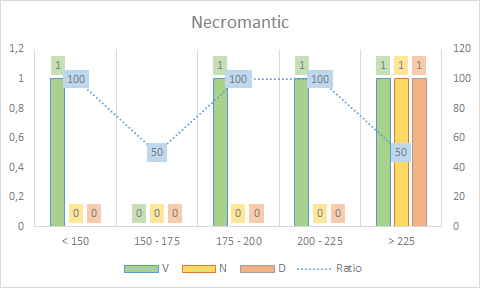 1 in Chaos Pact and Vampires is one of the surprise team choices, placed at the head of Necromantic this year, as in 2016, the only other tournament he played with them. Few lessons to be learned from the study of its results. He released a record of 4/1/1 in 2016, losing to Justicium’s Undead. Despite the few stats on the Necromantic roster, we all know that his opponents will have to deal with an opponent as experienced as talented. 11th (yes yes 11th) selection for Topper! This ultra-experienced player has already played Orcs (6/3/3), Amazons (2/3/1), Norse (13/8/9) and Necromantic (5/6/2). 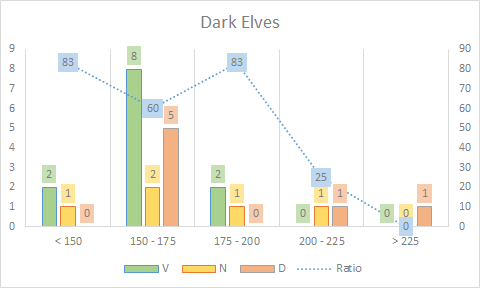 This year Topper will lead the Dark Elves, a roster on which he finally played only 13 games so far, for a balance of 9/2/2 (76.92 ratio). His results are very good, but as with some of his teammates, the lack of games with this roster is something to watch out for. But we know that the player is a very good level! I mentioned in the introduction of little used rosters chosen by the Danish coaches and Tripleskull is the best example. 150 NAF in Chaos Dwarves, and only 3 games played with this roster! Tripleskull will play his 8th Eurobowl this year. We could have seen on Lizards or Wood Elves, his best rosters, and those most played on the European scene, but no, it is in Chaos Dwarfs that he will challenge the best European players this year. 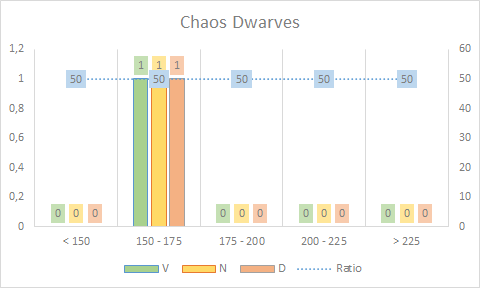 Without being able to rely on its statistics in Chaos Dwarves, we can raise its balance sheet to 22/8/13 on all previous Eurobowls, for a ratio of 60.46. After a fairly rapid progression in the early years, the Scottish team is more used to the second half of the table since 2012. It is therefore interesting to find them in 7th place in the NAF rankings, after two 12th consecutive places since the Italian World Cup. The year of the rise? The Scots have also decided to rely on a very experienced selection. 26 caps in total for this 8, without any rookie player of the competition. The Scottish captain will play in Cardiff his 5th Eurobowl, with his Norse for the second year in a row. 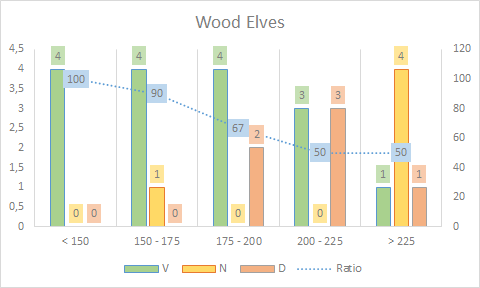 He had, until then, already played Wood Elves twice (4/5/3) and High Elves (1/2/3). Last year he played the Eurobowl with Norse, leaving a record of 2/1/3. He knows very well the Norse roster, since it is, by far, the roster he has played the most. 92 games in total, for a ratio of 59.24 (44/21/27) and most importantly, no rank of opponents in negative. 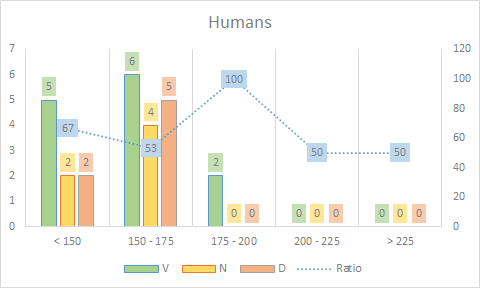 It is quite largely positive on the players to more than 175 NAF, being even at the balance on the + of 225, and all on a roster which is still very complicated to manoeuvre. The Scots should be able to count on their captain to show the way this year! Despite an average of almost 196 NAF for his team, Garrick is the only player to exceed 200 … But for the moment he far exceeds them! 4th in the world for Dark Elves and 12th overall, it’s nothing to say that this player is very experienced! For his 6th Eurobowl, Garrick resorts to his heavy artillery with Dark Elves for the 4th time. 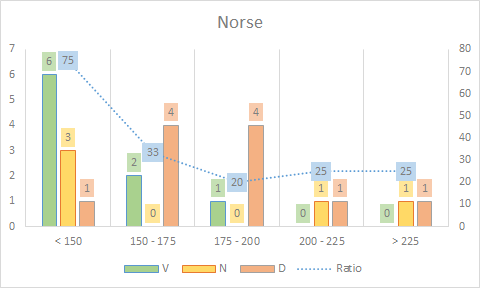 In 2013 and 2014, however, he had played Norse (6/3/3), but with his roster of predilection, his record is currently 7/6/6 (52.63 ratio) … Little consistent with its NAF ranking so , but his first participation, in 2012, for his 3rd tournament, plummets his statistics (1/3/3). 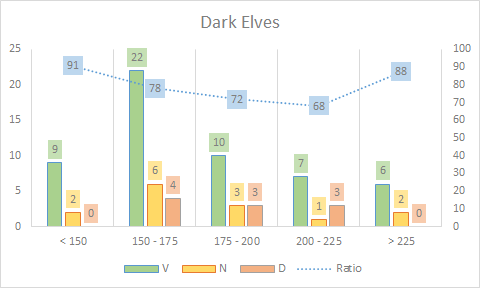 Overall, Garrick is 133 games played in Dark Elves, for a ratio of 69.92 (78/30/25). We can expect him to know the match-ups by heart. His statistics are clearly good, but they are slightly weighted down by the games he played against opponents over 225. 2 wins in 14 games only, it still remains very solid against the 175 – 225 (and necessarily in below). He will clearly be the driving force of this Scottish 8 and it would be a matter of tackling the matches against him as seriously as possible. Second selection for the Wood Elf coach, after his course of 2017, where he had made a neutral record (3/0/3). It is remarkable to watch the tournaments played by Sadface … and one wonders if there is no seizure error for this year’s Birdie Bowl, the only tournament where he played anything other than Wood Elves. In the end, it’s 61 games on this roster, for a good ratio of 61.48 (32/11/18). It can be noted that although his results are good overall, he has a lot more trouble when the skill level goes up. He has a very good ratio of 62 on the 175 – 200 slot, but he has not won any of his 6 games against coaches> 200. 15 years of tournaments for Valen, who will appear for his 5th Eurobowl with the High Elves, after 3 Dwarf appearances (8/5/5) and 1 Chaos Dwarf (4/1/1). 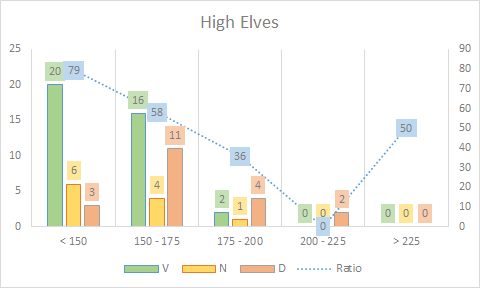 A radical change of style of play for him, but he is not a beginner on this roster so far: 9th world in High Elves, with a global balance of 38/11 / 20. If we stick to these only figures, we can note the strength of the coach on a roster considered unstable. But by focusing on the details of his statistics, we note that if he masters rather well its subject, things get complicated at the same time as the level of his opponents increases; even if it is in a weak field, since he has faced only 9 times players to more than 175 NAF in 69 games. Present in the group since 2016, Loki will celebrate his third selection in Cardiff. 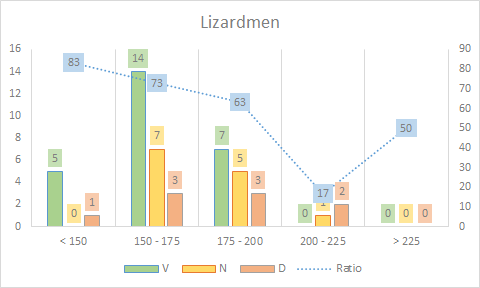 He was systematically at the head of the Lizardmen during his appearances in the national team, for a balance of 7/3/1, for an excellent ratio of 77.27. He does not have the highest NAF ranking in the group, but his results speak for him and he will probably be one of the team’s drivers to get a result. We note that its ratio in Eurobowls is greater than its overall on this roster, since it leaves a record of 33/11/22 (58,33 ratio), which is quite rare, logically also because the level of student in this type of competition. Again, the results drop quite quickly as the level of opponents increases. Will he be able to raise his level of play to bring his team to Cardiff? Second Eurobowl for the Chaos Dwarf coach, renewed on this roster despite its results that could be considered difficult last year (1/3/2). 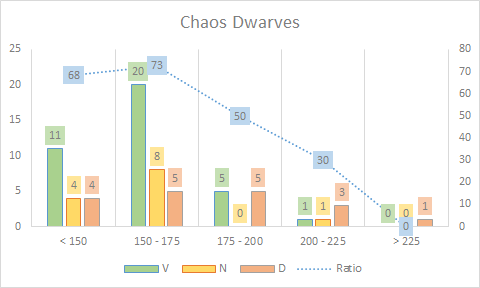 The Chaos Dwarves are however the roster on which he has the best statistics, rising to 188.12 NAF, for a ratio of 63.97 (37/13/18). GrumpyMaestro is not a beginner and despite his complicated results against opponents over 175 NAF, he knows very well his roster and match-ups. 5th Eurobowl for Sann,a real engine of our favorite game on the internet. Through his YouTube or Twitch channels , or the wealth of information from the NAF website, which he compiled and keeps up to date, we can not say that he counts the time he devotes to our passion to all. Anyway, what really interests us is how far he can take Scotland to the top of the standings. And it’s at the controls of a Necromantic roster that he has played the most, which is impressive when you think he has only 43 games, for 80 tournaments played, he will be present in Cardiff. 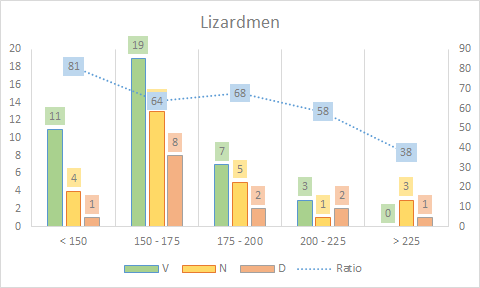 While he also played at Eurobowl, Norse (3/1/2), Lizards (1/2/3) and Undead (3/2/1), he will play Necromantic for the second time , after his 1/3/2 of 2016. 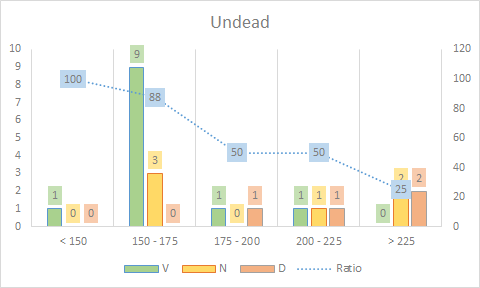 Given this result and those he could get playing Undead or Norse, this may seem surprising, but when we dwell on his graph, we see that it is far from a player easy to defeat. It is indeed positive if we take the opponents of more than 175 NAF ranking, having finally lost only 2 games out of 5 against the> 200. An opponent who will be wary more than his ranking (far from bad eh) NAF can not believe it. 6th selection for the Undead coach, present on the European scene since 2009. So far, he has tried a different roster for every edition he has participated in (Skaven, Wood Elves, Dwarves, Dark Elves and Undead). This is the first time he is rerun on a roster already played so, taking the Undead, after his 1/3/2 of 2016 (oh well, like Sann and his Necromantic actually!). 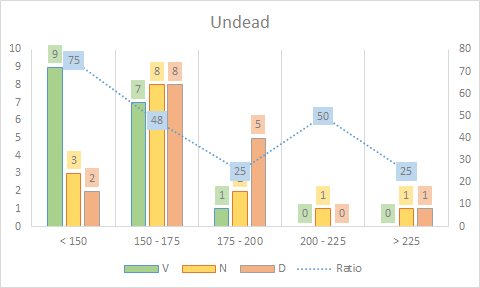 With 48 games played in Undead, for a score of 17/15/16 and a ratio of 51.04, Donshula does not present himself as a terrifying prospect, but mistrust: he has played Undead regularly this year, staying on a dynamic of 3 tournaments in a row and we can imagine that it will arrive at the Eurobowl ready to fight.